Sixty per cent of Fijians say there is freedom of speech in Fiji, an opinion poll reveals. The latest weekly Fiji Sun-Razor poll also shows that people believe they are free to write on social media and/or voice their opinion on or outside social media. In the lead-up to the 2018 General Elections, respondents were asked: Is there freedom of speech in Fiji? Are people free to write on social media or voice their opinion on or outside social media? 60 per cent responded ‘Yes’, while 21 per cent said ‘No’. Nineteen per cent said they were unsure. The poll is conducted weekly through face-to-face interview with 500 Fijians in Central Division, 300 in Western Division and 200 in Northern Division. 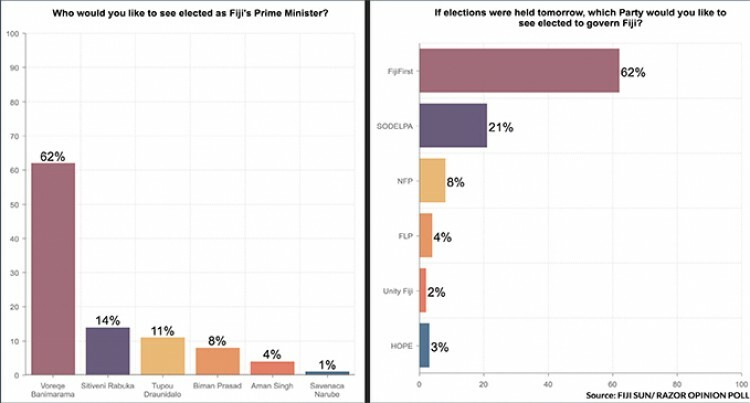 The same poll, carried out in the 2014 General Elections, showed that FijiFirst would form the Government. The trend in this poll mirrors the one in 2014. FijiFirst has regained the percentage points it lost last week. It is now back at 62 per cent. The other significant feature of this poll is the powerful debut of Tupou Draunidalo, leader of the newly formed HOPE Party. She joins the field of candidates for preferred prime minister and scored 11 per cent. She beat her former leader, Biman Prasad of the National Federation Party, who is struggling to reach double digits with eight per cent approval. This is a big blow to Mr Prasad who has been busy campaigning and was said to be making waves in the electorate. In 2014 Mr Prasad stood shoulder to shoulder with Ms Draunidalo and won their seats. But her strong views against Mr Rabuka made her drift away from Mr Prasad. Mr Prasad did not want to sever any ties with Mr Rabuka because NFP and SODELPA may form a coalition Government. Ms Draunidalo left NFP because she was not comfortable with NFP’s strategy with SODELPA. Before Ms Draunidalo left NFP, the Opposition for the first time had decent approval rating. After her departure, NFP struggled to get double digit approvals. HOPE also made an impressive start. It scored three per cent ahead of Unity Fiji on two per cent. Fiji Labour Party is at four per cent.